Hi everyone. I'm so sorry I'm such a bad poster. I have been reading all your blogs and have been feeling ashamed at the lack of creativity coming from my little corner of Ireland but all that is going to change now! So: lots to share. Hmmm what's first. Well, Holmsey's second book, 'Can I be a Hare?' is nearly ready to be published..the illustrator is working hard on the pictures. Here, I'll show you why they take so long. This is the size of the finished picture. HUGE. The illustrator works so hard on them. This is an original piece of the artwork from the fist book. This is a photo of how one of the pictures is worked on in the second book. The first side is what is cut out: and then the fabrics are layered and painted...the detail is just miraculous. Paula Hickman is a genius. 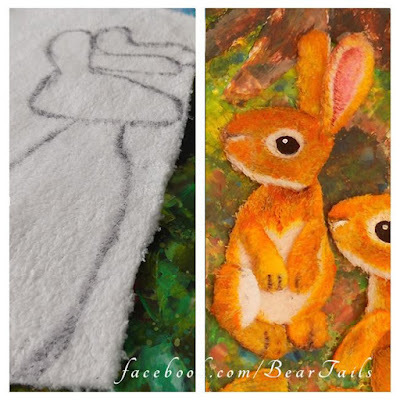 And yes, it seems there may be baby bunnies in my next story....OMG aren't they just sooooo cute???? Gorgeous. I'm so blessed to have been lucky enough to have this experience. My baby brother came and visited me from the UK for a long weekend. My younger brothers are identical twins and I love them to bits. They tower over me now but they will always be my baby bros. 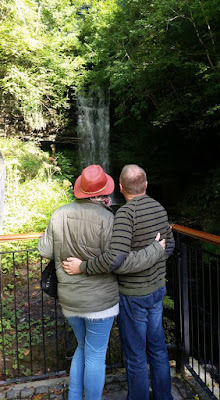 I was ill getting over the flu when he came over but we managed a great day out. We took him towards our favourite beach in Sligo, far from the tourist crowds. We had to stop at our wonderful warrior who protects Connacht from the evil hoards! 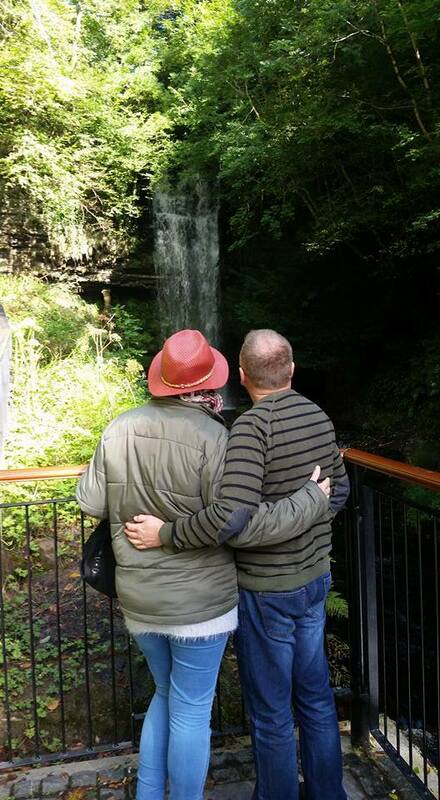 Then we wondered up to Glencar Waterfall and lake...a moment of romance for my wonderful husband and I. And a moment of pure fun with my granddaughter. I love that wee baby more than life itself..she is a real cutie. They've gone home now but we will hopefully see them at Christmas. I have not stopped giving up challenges. I was challenged to go on the back of a motorbike. I hate motorbikes. They are scary. It took me three years to learn to ride a pedal bike..I knew the second the person holding me up let me go: they let go, I dropped my legs. I'm a really scardy cat. My neighbour has classic motor bikes and he offered to take me up the road for a few miles on pillion. I agreed though if I'm honest I was bricking it. My two sons were here watching me and I had to do it. The whole point of this is to teach my children to not be afraid of trying new things and to never give up just because life can be dark and hard. Scary mad dangerous things they are rofl. I did enjoy it after a while but I'm sure I would do it again. We'll see. I did the day after chemo after no sleep for 48 hours because of the sterioids. I'm surprised I could even hold on, my bloods were dropping so fast! But I did it. Another fear conquered. Crafting wise I've nearly finished crocheting a cardi for my little granddaughter...it was easy until I got to the final trim which is all technical and I've never done the stitch before but again, I refuse to be beaten. I love crochet and its ok to pick up and put back down when I'm not feeling so good. It's much easier than I can with knitting. I have been doing some cross stitch. 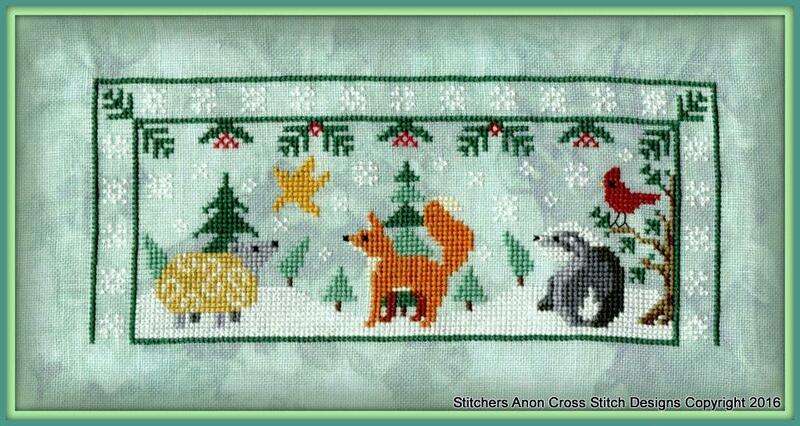 The first part of Holmsey's Winter Wonderland has been stitched and I enjoyed every stitch of it. I've never designed a badger before..I was quite proud of myself! It's been model stitched on Polynesium linen from Chromatic Alchemy and it's my new favouritist fabric ever! It will be released on the 1st of November, the next one in December and the one after that in January. 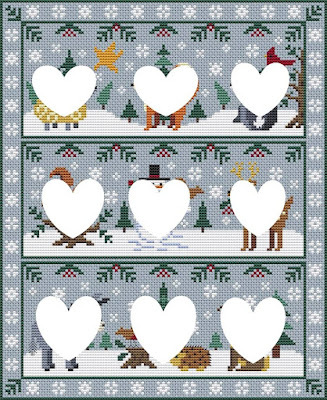 The panels can be stitched individually and turned into pinkeeps or flatfold or even little cushions. Or as one picture which is what I will be doing. Health wise I'm good, I finished my chemo yesterday. Seriously, 18 chemos over 6 months, three weeks on and one week off...I feel like I've run a marathon. I get next week off, a cat scan the week later and then a meeting with my oncologist the week after that. I'm glad to get a few weeks off. A few weeks of normal. We spent the 6 months remodelling the house. We now have a proper bathroom..with a lovely big bath and the halls have been decorated and painted and I decorated all my kitchen as well. I'm looking forwards to some time doing things I enjoy. The tiredness and chemo low should wear off by Tuesday and then I get some normal life, until the next lot of tests. I feel ok at the moment and that is all anyone can hope for. Today is a good day. Now,where did I put that crotchet? Good for you on taking those challenges! Holmsey's Winter Wonderland looks very nice. Thank you for sharing the photos of your adventures. Love the photo of you and your granddaughter on the swings. Have a relaxing weekend! Wonderful post, sharing your life with us again! That artwork for your next book is beautiful! Yes she does great work! You have had lots of time with family, which is always so important...Yay! I actually loved riding a motorcycle... tho now I don't know anyone that has one! Stitching and crocheting are soothing to the soul, so keep at it as much as possible! Love to you! Biggest Hugs! Those baby bunnies are so very precious. 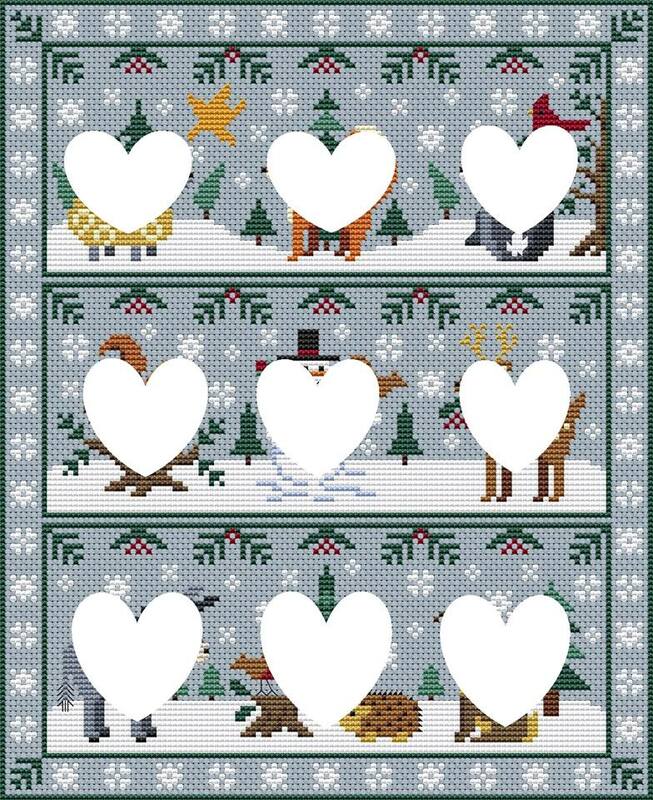 The linen you are stitching Holmsey's Winter Wonderland on is absolutely fantastic! Take good care of yourself Gaynor. Hugs and prayers for you! Looks like you've been really busy! Well done for conquering your fear of being on a motorbike. Hello Gaynor, its lovely to see a post here, you were brave on that bike, your wouldn't get me on one of those! Love the pic of you both on the swings, your granddaughter has a lovely smile. Sending lots of love your way, and hopes for good results from the tests. You certainly have been busy! I love the photo of you with your granddaughter, she has a beautiful smile. My brother has a motorbike - I had a ride on the back once and I think it's the most scared I've ever been! Love the print for your second book, this is so sweet!! 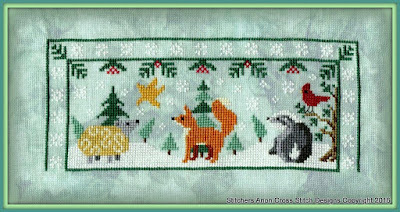 OMG, I have to try that gorgeous fabric from Chromatic Alchemy, it looks fabulous and goes very well with your latest design! Good luck for all the tests. I'm looking forward to your second book. The print is adorable. You are much braver than me going on a motorbike. You won't get me on one. Ever! I look forward to watching your new design appear each month--hope you have a good free week to relax and do the things you most want to do... Take care now!